Wide range of thicknesses and sheet sizes available. Used a lot for laser cutting purposes. Good quality MDF with clean edges and smooth surface. 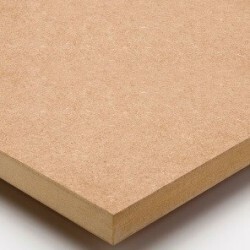 2mm MDFVarious sheet sizes available - please see options above.Please note if a standard sheet size..
3mm Medite Premier MDF - Low Formaldehyde Grade E1Good quality MDF board with clean edge.Various she..
4mm Medite Premier MDF - Low Formaldehyde Grade E1Good quality MDF board with clean edge.Various she..
6mm Medite Premier MDF - Low Formaldehyde Grade E1Good quality MDF board with clean edge.Various she..
9mm Medite Premier MDF - Low Formaldehyde Grade E1Good quality MDF board with clean edge.Various she..
12mm Medite Premier MDF - Low Formaldehyde Grade E1Sheet size 1220mm x 610mmGood quality MDF board w..
15mm Medite Premier MDF - Low Formaldehyde Grade E1Sheet size 1220mm x 610mmGood quality MDF board w..
18mm Medite Premier MDF - Low Formaldehyde Grade E1Sheet size 1220mm x 610mmGood quality MDF board w..
25mm Medite Premier MDF - Low Formaldehyde Grade E1Sheet size 1220mm x 610mmGood quality MDF board w..